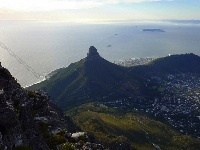 Robben Island is seven miles (11km) from Cape Town in the centre of Table Bay, easily seen from the shore. For nearly 400 years, this tiny rocky island was utilised as a place of banishment, exile, isolation, and imprisonment for numerous categories of people ostracised by society, ranging from political protesters to lepers. During the years of Apartheid, Robben Island became synonymous with institutional brutality as numerous freedom fighters, including the island's most famous resident, Nelson Mandela, were imprisoned here for more than a quarter of a century. Robben Island is now a museum, symbolising the liberation and triumph of the human spirit. Regular island tours are conducted, lasting three and a half hours. The tours, which are guided by former prisoners, include a visit to the maximum-security prison on the island where an estimated 3,000 freedom fighters were incarcerated between 1962 and 1991. The island is also interesting in other ways. For instance, it is a magnet for shipwrecks, with at least 68 recorded cases across its rocky coastline. The boat trip across the bay can be really fun in itself, and some wonderful views of the city and Table Mountain are gained from the ferry ride and the island itself. Opening times: Boats leave roughly every two hours between 9am and 3pm (weather dependent). Admission: Tours are R300 (adults), R160 (children under 18), which includes the return boat trip across Table Bay.